Your Glass is a sleek piece of ultra-pricey hardware that is only as good as the apps that power it. Take advantage of the myriad of applications that are made possible when your smart eyepiece is equipped with the right set of glassware. Here are a dozen such apps you can download for free from the Google Play store. This native app from Google allows you to easily and more efficiently manage your Glass across multiple platforms, including iOS, Android, and your desktop OS. The free MyGlass app guides you in setting up your Glass’ Wi-Fi connection and Android device pairing. It also enables you to screencast (or allow other users to view what you are seeing on your Glass through the display screen of your mobile device), identify your location so that you can take advantage of Google’s turn-by-turn directional feature, as well as send and receive SMS text messages. This third-party glassware is designed to serve as an alternative to the MyGlass app. JoeGlass connects to your Glass through a Bluetooth-enabled Android device, enabling you to take photographs, view the status of your device, send SMS text messages, and share content via Twitter and other online services. Although its Glass support is still in beta stage, SecureTXT remains the pioneering messaging app for Google Glass users. The app is noteworthy for its minimalist-style user interface, which is most suitable for viewing on the Glass. SecureTXT touts its ability to encrypt sent messages and to decrypt them when they reach their intended recipient, as well as offering a safety feature that prevents people from taking screenshots of your chat sessions with them. Supporting a hands-free system of keeping track of the real-time information being sent your way, this free app enables you to view your phone notifications on your smart eyewear. Just remember to activate Google Glass Notifier on your Android device by going to the Settings menu and selecting Accessibility. Because your Google Glass interface is not designed for typing–such as when you need to specify URLs for Web pages you’d like to view on your Glass, for example–an Android app like GlassCast becomes invaluable. On the Android smartphone or tablet you have paired with your smart eyewear, use GlassCast to locate the desired item such as a file, video, or website and then “cast” this information to your Glass, which you then activate by an “okay Glass” voice command. This free mobile app enables you to view the status of your Android smartphone through your Glass. A readout containing your phone’s battery discharge level, for example, is shown on your Glass display screen. Phone Status Glassware also offers an option to be notified when your smartphone has reached a certain percentage of battery power consumption. The free GeoChat app works on your desktop browser, Android-based mobile browser, and Google Glass. It allows you to chat with and send private messages to online users within range. GeoChat also lets you take pictures and send uploaded images to other users. To clear the screen while using the app, just shake your Glass. This free fitness app serves as a step counter for your Google Glass and Nexus 5 pairing. With Step Counter, you don’t need to look at your smartphone to determine the number of steps you have taken during your walk. Gaze up while wearing your Glass, and the Step Counter glassware tells you the number of steps. If you are color-blind or have trouble identifying certain colors, then Google Class Color Identifier can help improve your viewing experience when you’re wearing your Glass. The app activates the camera, shows a target focus, and trains the target focus on any problematic area for the wearer. Through a text label, the app then informs the Glass wearer the actual color of the targeted area. This handy glassware enables you to receive and view on your Glass screen any image, text, and Web page from a connected Android device. The Send to Google Glass app works free of Bluetooth connection, since your Android device has already been seamlessly paired with your Google Glass. Glass Authenticator helps you to properly integrate your Glass with Twitter. Activate Glass Authenticator via a “show tweets” voice command, and enjoy Twitter’s bite-sized multimedia experience. You can retweet and favorite tweets, as well as open hyperlinks. When you turn off the screen, Glass Authenticator takes up again where you left off the next time you open the app. Wearable Widgets shows your chosen smartphone widget on the Glass screen interface. Although the free version only supports one widget at a time, you are still getting a fantastic deal in having your favorite widget at a glance and without having to check your smartphone each time. 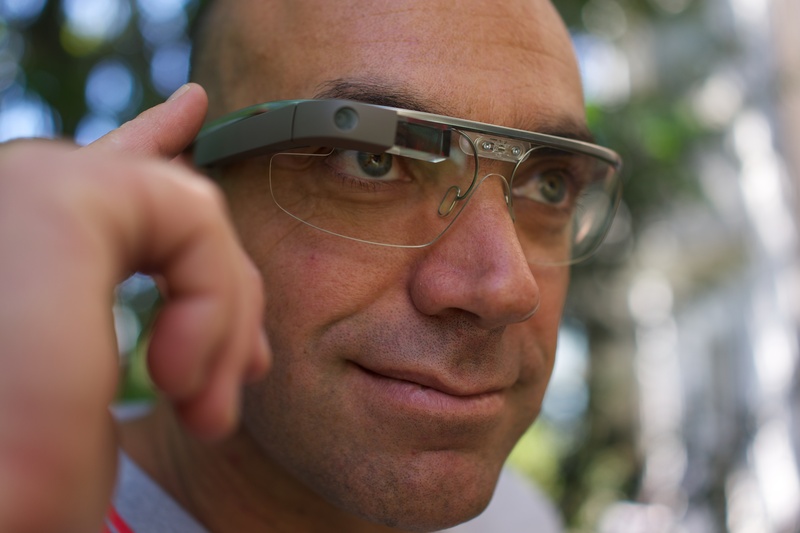 To activate Wearable Widgets on Glass, say the “okay Glass, show widgets” voice command. The glassware can also be used on other wearable gadgets such as Samsung Gear and Sony SmartWatch.